Welcome to the Recreational Flight store. First select a product category to simplify your shopping. You can order online or by phone. We ship your gift-certificates the same day by email, by regular mail or by Express-Post at your choice. If your order is urgent, no worries! We can send your gift-certificates by email at no cost for instant delivery! Our classic Pilot For A Day FLEX PACKAGE. Take control of the airplane in the pilot seat !! Duration: 1h30 including a 1 hour flight. Available all year round ! Take a 30 minutes preparation course than take control of the airplane in the pilot seat with an instructor by your side for 60 minutes. * Choose among the airports offered for this package by Recreational Flight at the time of your reservation. Currently St-Hubert, Beloeil, Lachute, Les Cèdres. Our classic apprentice pilot FLEX PACKAGE. Duration: 1h00 including a 40 minutes flight. Take a 20 minutes preparation course than take control of the airplane in the pilot seat with an instructor by your side for 40 minutes. * Choose among the airports offered for this package by Recreational Flight at the time of your reservation. Currently St-Hubert, Beloeil, Lachute, Les Cedres. Our classic pilot for the day. Departure from Beloeil airport on the South-Shore of Montreal. Duration: 1h30 including a 60 minutes flight. 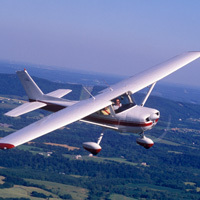 Take a 20 minutes ground school and fly the airplane in the pilot seat with an instructor by your side for 40 minutes. A flight certificate with your souvenir picture taken with your camera is included as well as a 15$ credit for your next flight. An unforgetable gift. *Additional flight time available by block of 15 minutes. Departure from Beloeil airport near Montreal. 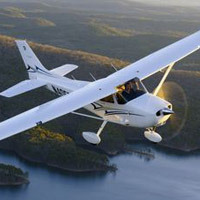 Take a 20 minutes ground school and fly the airplane in the pilot seat with an instructor by your side for 40 minutes. A flight certificate is included as well as a 15$ credit for your next flight. An unforgetable gift. * Additional flight time available by block of 30 minutes. * Souvenir video of your flight available to purchase in this store. 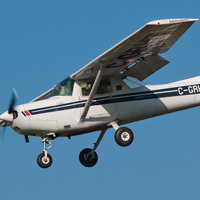 Take a 20 minutes ground school and fly the airplane in the pilot seat with an instructor by your side for 40 minutes. A fantastic experience. Take a 30 minutes ground school and fly the airplane in the pilot seat with an instructor by your side for one hour. A flight certificate and your souvenir picture taken with your camera is included as well as a 25$ credit for your next flight. An unforgetable gift. Location: St-Hubert airport near Montréal. 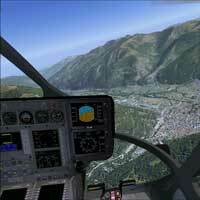 Take the control of an helicopter simulator! Duration: 40 minutes, including 30 minutes of flight simulator and 10 minutes of pre-training. Receive a short training on how to fly an helicopter and on the simulator itself than be ready to live the great experience of being in command of an helicopter. Chose among various helicopter types. The helicopter simulator is mobile and mounted in a real Bell 206 cabin! You will experience the magic of flying through an virtual reality system. A great experience and a memorable gift . Minimum age of 13 years old. Duration: 60 minutes, including 50 minutes of flight simulator and 10 minutes of pre-training. NEW! 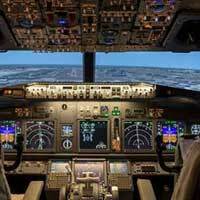 Take the control of an Airbus 320 simulator! After a short 20 minutes theoretical training on how the airplane flight simulator works and some basics aviation principles, take the captain seat of an Airbus 320 flight simulator for 60 minutes. A professional flight instructor will assist you as needed. Choose the location of your flight among the 24,000 possibles destinations ! Take the control of an helicopter simulator with a friend! Package good for 2 persons. Duration: 70 minutes, including 60 minutes of flight simulator and 10 minutes of pre-training. Come fly a professional drone with us! A first in Canada ! Duration: 90 minutes including the training and 3 drone flights of 15 minutes each. This training will allow you to take control and to experiment professional drone flying. During approximately 1 hour 30 minutes, you will receive a training of the aircraft, its performances and how to fly it and then you will be in command of the drone for 3 flights. With a flying instructor by your side to assist you and teach you, your flight will be done in safe conditions. For your last flight, if you want, we will give you a mission to test your drone pilot skills. Fly tandem on a trike ultralight aircraft with an instructor. The aircraft take-off from a runway on the ground. An unforgetable experience. Maximum weight of passenger: 350 lb. 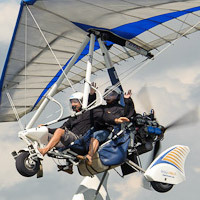 Fly tandem on a trike ultralight aircraft with an instructor. The aircraft take-off from a runway on the ground. This package also includes a professional digital photography of you in-flight. A 25$ crédit is also included for a futur purchase from volrecreatif. An unforgetable experience. Do you like thrilling adventures ? 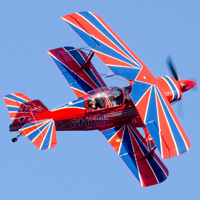 Come and experience an aerobatic flight! Stalls, Looping, Spirals, Spins, and more ! Departures from St-Hubert-Longueuil airport near Montreal. Duration : 60 minutes including 20 minutes of ground school and 40 minutes of flight. After a 20 minutes ground school lesson, take your seat in the aircraft with an instructor by your side for 40 minutes and live the unique experience of an aerobatics flight! This introductory flight will allow you to live an emotion rich experience aboard a Super Decathlon, a well known aerobatic airplane. 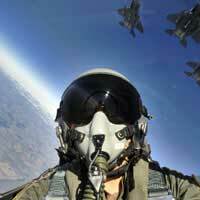 You will try several aerobatic maneuvers like inverse flight, barrels, loopings and several more. Are you ready for a good adrénaline dose? Activity available all year round ! An unforgettable gift. Maximum weight of 200 pounds. Valid location: St-Hyacinthe area. 45 min from Montreal. Live the experience of a glider flight. Get towed to 3000 feet by the tow plane then glide in silence and admire the beautiful scenery. Approximate flight lenght: 20 to 30 minutes. Maximum passenger weight of 240 lbs. From May to October. Reservations required. Weekends and statute holidays according to availability. A must not to miss out ! NEW AND UNIQUE! 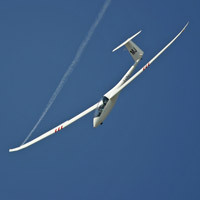 GLIDER AEROBATIC FLIGHT! 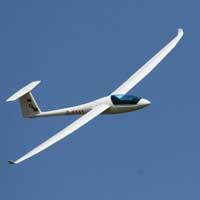 Live the strong experience of a glider aerobatic flight! Loops, rolls, vertical climbs, inverted flight... ! - Towing to an altitude of one mile (5280 feet or 1.6km )for the aerobatic flight ! - Possibility of taking the controls towards the end of the flight. Reservation required. Weekend booking mainly. Activity location: St-Hyacinthe area (St-Dominique), 45 min from Montréal. Approximate total flight duration of 20 à 30 minutes. MINIMUM PURCHASE OF TWO PACKAGES TO GET THIS OFFER. Take place in a powerful biplane aerobatic aircraft with a stunt-flying instructor for 20 minutes and live the unique experience of an aerobatics flight! This introductory flight will allow you to live an emotion rich experience aboard a Pitts, a well known aerobatic airplane. This airplane can reach 340 km/h a make you experience acceleration forces up to 6 positives g and 5 negative g! Fly tandem with an instructor at mount Yamaska near Granby. 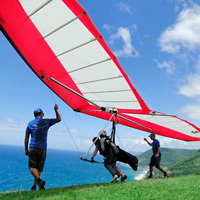 Just like a standard glider, the hang-glider is towed by an ultralight aircraft from the ground to 2500 feet. The cable is then released and the freee-flight starts ! A flight last aproximately 20 minutes depending on weather and wind conditions. An unforgetable experience. Maximum weight of 210 lbs. Fly tandem with an instructor at mount Yamaska near Granby. A flight last aproximately 20 minutes depending on weather and wind conditions. Mountain take-off at 1100 feet. An unforgetable experience. Maximum weight of 235 lbs. Helicopter - Montreal city tour - 20 min. 1pers. Take-off from St-Hubert for a city tour of Montreal. Location: St-Hubert airport on the South Shore of Montreal. Total flight duration: 20 minutes. This package good for 1 person. Minimum purchase of 2 packages. Two persons minimun to reserve a flight. 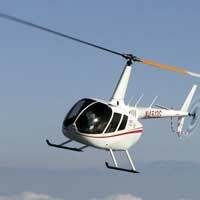 Each helicopter can contain a maximum of 3 persons and the maximum total combined weight per helicopter is 650 lbs. Helicopter - Montreal city tour - 30 min. 1pers. Total flight duration: 30 minutes. Location: Departure from Montreal - Rivières des Prairies. Flight above the Laurentians with a stop on a lake. Experience the feeling of liberty of flying in a floatplane! Take-off from the St-Lawrence River for a 2 hours flight toward the beautiful lakes and scenery of the Laurentians. At mid-course, land to take a break on a nice Quebec lake. It is possible to extend the flight on demand at purchase time. Conditions: Reservations required. Flight can be rescheduled due to weather conditions. This package is good for 3 persons. Maximun weight of 600 pounds or 270 kg. Flight above the Laurentians or Montreal downtown at your choice. Duration: A one hour flight. 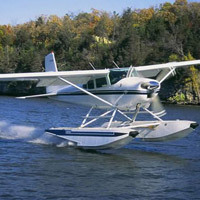 Experience the joy of flying in a floatplane! Take-off from the St-Lawrence River for a 60 minutes flight toward the beautiful lakes and scenery of the Laurentians or toward Montreal downtown at your choice. It is possible to extend the flight on demand at time of purchase. Conditions: Reservations required. Flight can be rescheduled due to weather conditions. Maximun combined weight for the passengers of 600 pounds or 270 kg. Location: Departure from Montreal - Rivières des Prairies. Flight above the Laurentians or Montréal. Duration: 1 hour 15 minutes including a 60 minutes flight. Experience the joy of flying a floatplane ! After a presentation on the controls of the aircraft, take-off for a 60 minutes flight in which your instructor will demonstrate a landing and take-off on water on a Laurentian lake or on the St-Lawrence River. 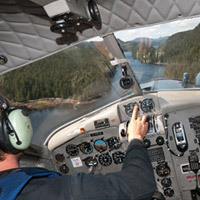 During the flight, the instructor will give you the control of the aircraft and you will live the magic of flying a floatplane above beautiful lakes and landscapes. It is possible to extend the flight on demand at purchase time. Conditions : Reservation required. Can be rescheduled due to weather conditions. One person per flight. 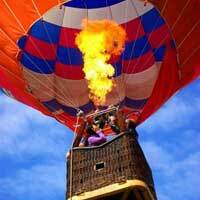 Hot air balloon - Private Flight - Mtl. Valid locations: Montreal area: St-Jean sur Richelieu. 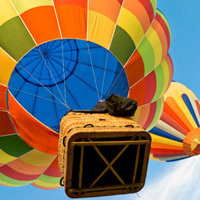 Live the peacefull experience of a Hot air ballon ride with your family, friends or loved one. - An initiation to the handling of a hot air baloon. The price is for 3 persons or two adults and 2 children. Important: The total weight of passengers may not exceed 500 pounds. Location: Departure from La Tuque. Duration of flight: 20 minutes. This package is good for 1 person. Minimum purchase for 2 persons. 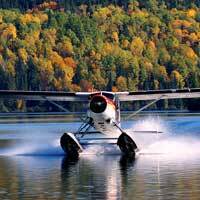 Experience the joy of flying aboard a floatplane with a real bush pilot! Take-off for a flight toward the beautiful lakes and the great scenic views of the Mauricie Region. Duration of flight: 45 minutes. Duration of flight: 60 minutes. Duration: 3h30 including approx. 1.5 hour of flight time. Take-off for a lunch by the lake in one of Québec`s most famous fishing lodges: La Seigneurie du Triton. Let the chef prepare your lunch on a wood fire while you`re enjoying nature. 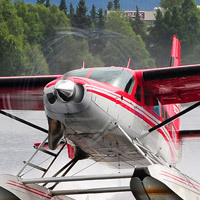 Experience the joy of flying aboard a floatplane with a real bush pilot! Take-off for a flight over the beautiful lakes and the great scenic views of the Quebec province. Included: Shore lunch meals (soup, salad, barbecue dish, sides and dessert). Conditions: Maximun total combined weight of the passengers of 600 pounds or 270 kg. Location: Departure from Quebec City toward Tadoussac and return. Duration: 7h30 including approx. 2h30 hour of flight time. Take-off from Quebec City aboard a floatplane toward Tadoussac. Fly over the beautiful Saint-Lawrence River. 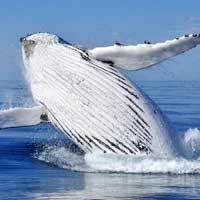 You will then embark on a whale-watching cruise. Take a break to enjoy the area or to take a lunch before flying back to Quebec city aboard the seaplane. Included: Whale cruise. Not included: Lunch. Total duration: approximatly 2 hour, including a 60 minutes flight. Departure from St-Hubert airport close to Montreal. Do you like thrilling adventures ? Come experience an aerobatic flight aboard a Aerobat. Stalls, looping, spirals, spins, and more ! Duration of flight: 40 minutes on an Aerobat aircraft. Take place in an Aerobat, an aerobatic training aircraft, with a stunt-flying instructor for 40 minutes and live the unique experience of an aerobatics flight! This introductory flight will allow you to live an emotion rich experience. 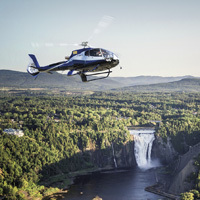 Helicopter - Tour - Quebec - 15 min.- 1pers. Discover Quebec city from above! Duration of helicopter tour: 15 minutes. Climb aboard one of our helicopters and take in the best view of Quebec City! Fly over this historical city, the cradle of French America and see the prestigious Château Frontenac overlooking Old Quebec, a UNESCO World Heritage site. See the beauty of the majestic Saint Lawrence, the Plains of Abraham and its impressive British fortifications - the only ones of their kind in North America. Fly over historic Quebec City and see its main attractions. Free access for one person to the Helicopter Discovery Hub *. * Activities offered subject to availability. Helicopter - Tour - Quebec - 45 min.- 1pers. Fly toward the Jacques-Cartier National Park and admire glacial valleys, rivers and mountains! Looking for landscapes that will take your breath away? Go on an adventure and see the magnificence of Park Jacques-Cartier. Be amazed by the natural beauty of this mountainous plateau with its deep glacial valleys. See the Boreal forest with its beautiful mix of conifers and deciduous trees! You might even fly over a moose, caribou or bear! Parc national de la Jacques-Cartier, a 670 km2 mountainous plateau cut with deep valleys. The terraced vegetation of the Boreal forest where deciduous and coniferous trees stand side by side. A chance to spot indigenous animals including caribou, moose, eagles and sometimes even bears! Fly over Park Jacques-Cartier, with its mountainous plateau, deep valleys and one of the largest rivers in Quebec. A $25 meal coupon for the restaurant-bar on the premise *. 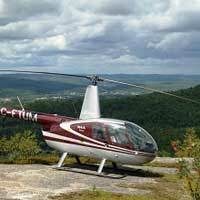 Helicopter - Tour - Quebec - 60 min.- 1pers. Quebec, the full tour. Discover the splendour of the Quebec City and region! New for 2017: Quebec, the full tour! 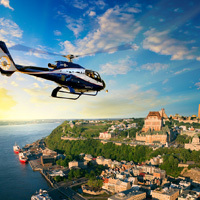 A one hour tour in our ultra-modern helicopters including a flyover of magnificent and historical Quebec City, the Saint-Lawrence and its breathtaking landscapes Fly over Quebec City. See its architectural beauty, the Montmorency Falls and Ile d`Orléans as well as the unspoiled beauty of its natural surroundings. The spectacular natural architecture of the Quebec City region: the meandering Montmorency river, lakes, mountains and the terraced vegetation of Boreal and mixed forests. An unforgettable flight experience with picturesque landscapes! The spectacular natural architecture of the Quebec City region: the meandering Montmorency river, lakes, mountains and the terraced vegetation of Boreal and mixed forests... and much more! A fly over Quebec City. See its architectural beauty, the Montmorency Falls and Ile d`Orleans as well as the unspoiled beauty of its natural surroundings. The spectacular natural architecture of the Quebec City region`s natural architecture including the meandering Montmorency river, forests, lakes, mountains. Audio guide available in English, French, German and Spanish..
* 2 passengers minimum per helicopter is required for take-off. Possibility of pairing with another passenger when possible. You like thrilling adventures ? Come experience an aerobatic flight! Stalls, Steep turns, Spirals, Spins ! Departures from Beloeil airport near Montreal. After taking a 45 minutes ground school lesson, take place in the pilot seat with an instructor by your side for 60 minutes. You will live the unique experience of an aerobatics flight! Activity available all year round ! An unforgetable gift. Maximum weight of 250 lbs. You like thrilling adventures ? 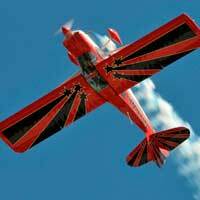 Come experience an aerobatic flight! Stalls, Steep turns, Spirals, Spins ! Departures from St-Hubert airport near Montreal. After taking a 20 minutes ground school lesson, take place in the pilot seat with an instructor by your side for 40 minutes. You will live the unique experience of an aerobatics flight! * Additional flight time available by block of 15 minutes. Take place in a beautiful and powerful Pitts Special biplane! This introductory flight will allow you to live an emotion rich experience aboard a Pitts, a well known aerobatic airplane. If you desire and want more than a scenic ride, the pilot can make you experience several aerobatic maneuvers like inverse flying, barrels, looping and several more. Maximum weight of 205 pounds (93kg). Additional flight time of 15 minutes for St-Hubert airplane packages. Additional flight time of 30 minutes for Beloeil airplane packages. Valid locations: Beloeil airport, east of Montreal. Duration: 2.5 hours including a 45 min flight and a ground class of 1.5 hour. Number of person: 1 person. Maximum weight is 250 pounds. 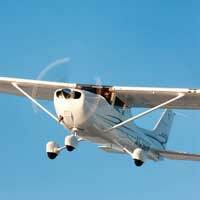 Take a flying lesson with a professional instructor with the objective of becoming an airplane pilot. This lesson counts in your training toward getting your pilot licence. This instructor will adapt the lesson to your level of pilot. 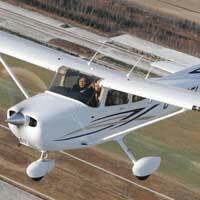 Your flying lesson is preceded by a ground school session where you can ask your questions. After your ground course, you will take place in the pilot seat in front of the instruments! You will receive an official certificate for your flight as a pilot and your logbook can be signed. You will get documents and explanations on the training curriculum and the fees. Discover Montreal from the air with your friends or family. The scenic tour of over 50 km will bring you over the principal attractions of Montréal: the beautiful Olympic Stadium, the St-Joseph Oratory, the Mount-Royal, the downtown area with the famous Place Ville-Marie tower, the Old Montreal, the Old Port, the Champlain, Victoria and Jacques Cartier bridges, St-Helen Island with its fort, Notre-Dame Island with the Montreal Casino and the Gilles Villeneuve Grand Prix race track. Get back to your departure point following the majestic St-Lawrence River with the Boucherville Islands. Departure from Beloeil airport close to Montreal next to Mount Saint-Hilaire. Duration of 45 minutes. The package is good for 1,2 or 3 persons aboard. The maximum combined weight of all 3 passengers is 500 pounds. A fantastic gift and experience. *Other option available to purchase with this package: Additional flight time available by block of 30 minutes. Admire the scenery of downtown Montreal. Approximately 30 minute flight. A beautiful gift. The price is good for up to 3 persons. Take the challenge and share an incredible experience with your friends!Take a 30 minutes ground school and fly the airplane in the pilot seat with an instructor by your side for 30 minutes. After the ground class each person will fly alone with his instructor. This certificate is valid for one person. A minimum purchase of 2 certificates is required for this activity. The maximum weight is 250 pounds. You will receive an official certificate for your first flight as a pilot. Live exceptional moments that you have always dreamed of. Take control of a real airplane and fly toward your dream. After your ground training, take place in the pilot seat in front of the instruments and start the engine ! 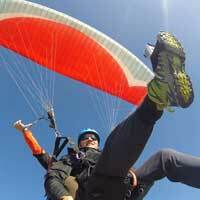 A professional instructor will supervise the flight by your side. You will receive an official certificate for your first flight as a pilot. The 2.5 hour experience includes a 45 minutes flight and 1 hour and 30 minutes of ground school including the preparation of the aircraft and the pre-flight checks. The maximum weight is 250 pounds. You always dreamed to be an airplane pilot ? Here is your chance! Duration: Approximately 2 hours, including 30 minutes of ground school, 30 minutes of flight simulator and 45 minutes of flight. 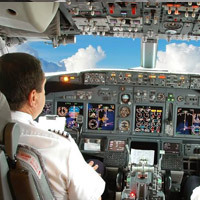 This package is the ideal way to live immediately the experience of a real pilot course. 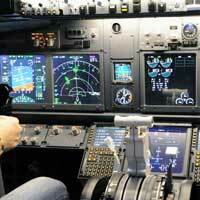 You will start tour initiation by a ground class followed by a professional simulator flight. You will then fly aboard a Cessna aircraft acting as the pilot in command ! The passion of flight will be transmitted to you forever ! Departure from Beloeil airport, west of Montreal. Discover the Richelieu River, the Mount St-Hilaire, the Bassin Chambly or even the city of Montreal from the air with your friends or family. Pick the destination of your choice. A fantastic gift or experience. Admire beautiful scenery from the air approximately 30 minutes flight. Choose the direction of the flight with the time you have. A beautiful gift. Up to 3 persons can take place aboard for this price. Maximum combined weight of 500 pounds. Admire beautiful scenery from the air approximately 40 minute flight. Choose the direction of the flight with the time you have. A beautiful gift. Up to 3 persons can take place aboard for this price. Admire beautiful scenery from the air approximately 50 minute flight. Choose the direction of the flight with the time you have. A beautiful gift. Up to 3 persons can take place aboard for this price. Discover the region of Montreal, the Richelieu River, the Mount St-Hilaire, the Bassin Chambly or even the city of Montreal from the air with your friends or family. Pick the destination of your choice. A fantastic gift or experience. Choose the destination of your choice. Approximately one hour flight. Departures from St-Hubert airport near Montreal. A beautiful gift. The price is good for up to 3 persons. Maximum combined weight of 500 pounds. Discover the great Montreal from the air with your friends or family. The scenic tour of 125 km will bring you over and around the entire Montréal Island. You will be able to see among other attractions: the Mille Îles River, Céline Dion`s house, Bordeau prison, Dorval airport, Mirabel airport, Deux Montagnes lake, Oka beaches, Beauharnois damm, St-Louis Lake, St-Joseph Oratory, Mount-Royal, Montréal downtown, Ville-Marie tower, St-Helen Island with its fort, the Montreal Casino, La Ronde amusement park, the Gilles Villeneuve Grand Prix race track, the Old Montréal and the Old Port, Champlain, Jacques Cartier and Victoria bridges, the Olympic Stadium. Then get back to your departure point following the majestic St-Lawrence River with the Boucherville Islands. Departure from Beloeil airport close to Mount St-Hilaire. Duration of 90 minutes. The package is good for 1,2 or 3 persons aboard. The maximum combined weight of all 3 passengers is 500 pounds. A fantastic gift and experience. Duration: 50 minutes including 20 minutes of pre-training and 30 minutes of flight simulator. Duration: 110 minutes including 20 minutes of pre-training and 90 minutes of flight simulator. After a short 20 minutes theoretical training on how the airplane flight simulator works and some basics aviation principles, take the captain seat of an Airbus 320 flight simulator for 30 minutes. A professional flight instructor will assist you as needed. Choose the location of your flight among the 24,000 possibles destinations ! NEW! 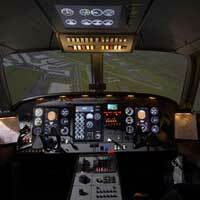 Take the control of a Airbus 320 simulator! After a short 20 minutes theoretical training on how the airplane flight simulator works and some basics aviation principles, take the captain seat of a Airbus 320 flight simulator for 90 minutes. A professional flight instructor will assist you as needed. Choose the location of your flight among the 24,000 possibles destinations ! After a short 20 minutes theoretical training on how the airplane flight simulator works and some basics aviation principles, take the captain seat of a Boeing 737 flight simulator for 30 minutes. A professional flight instructor will assist you as needed. Choose the location of your flight among the 24,000 possibles destinations ! After a short 20 minutes theoretical training on how the airplane flight simulator works and some basics aviation principles, take the captain seat of a Boeing 737 flight simulator for 90 minutes. A professional flight instructor will assist you as needed. Choose the location of your flight among the 24,000 possibles destinations ! Fly over the beautiful Old City, observe Montmorency falls and l`Île d`Orléans aboard a comfortable gyrocopter (Autogyro). We offer you the opportunity to discover the greater Quebec area from above by flying over major points of interest. 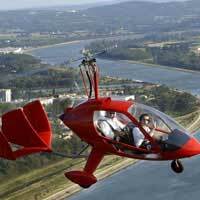 You will be aboard a gyrocopter: hybrid aircraft between a helicopter and an airplane, safe and comfortable. Maximum weight of 240 lb. Open all year round. Duration: 2h30, including a 60 minutes flight. The modern gyros are fascinating. Come live the experience of a private flight training with an instructor. 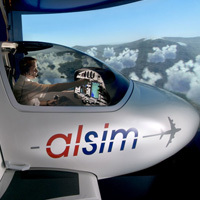 The experience includes a ground training of 90 minutes on the flying techniques followed by a 60 minutes flight training. Assisted by your instructor, you will learn the basic flying skills and fly above the magnific Chaudière Appalaches region. At the end, you will receive a pilot for the day certificate and a souvenir picture. You flight time is credited as a regular training. Departure from the aviation museum in Ottawa. Rockcliffe airport. Panoramic helicopter 10 min flight for 2 persons. In colaboration with the aviation museum of Canada, panoramic flights are now offered departing from the museum. The museum clients and people visiting the ottawa-Gatineau region can now live a memorable experience. Discover the national capital of Ottawa from the air. Fly above the ottawa river, Gatineau, Hull Casino, downtown Ottawa, the parliament of Canada and other beautiful attractions. A fantastic flight.The price is good for 2 persons. Maximum weight for the 2 passengers combined of 500 lbs. Flights available from mai to October. It is possible to add one additional person to this package for 49$+tx (To be purchased separately in the online store). Departure from the Aviation Museum of Canada in Ottawa. Rockcliffe airport. Panoramic helicopter 20 min flight for 2 persons. In colaboration with the aviation museum of Canada, panoramic flights are now offered departing from the museum. The museum clients and people visiting the ottawa-Gatineau region can now live a memorable experience. This extended flight also allow you to discover to your choice either the north of Gatineau and the Ottawa River or the south of Ottawa with th Rideau Canal. A fantastic flight.The price is good for 2 persons. Maximum combined weight for the 2 passengers of 500 lbs. Flights available from mai to October. It is possible to add one additional person to this package for 49$+tx (To be purchased separately in the online store). Panoramic helicopter 30 min flight for 2 persons. In colaboration with the aviation museum of Canada, panoramic flights are now offered departing from the museum. The museum clients and people visiting the ottawa-Gatineau region can now live a memorable experience. This extended flight also allow you to discover to your choice either the north of Gatineau and the Ottawa River or the south of Ottawa with the Rideau Canal. Discover the national capital of Ottawa from the air. Fly above the ottawa river, Gatineau, the Chelsea Dam, the Hull Casino, downtown Ottawa, the parliament of Canada and other beautiful attractions. 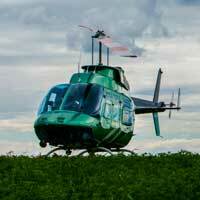 Become an helicopter pilot and fulfill your dream! This package is designed for people that wants to become an helicopter pilot.
. You will receive a detailed information package and get a presentation on the unfolding of the pilot training. A pilot cap will be given to you to mark the launch of your pilot training and a substantial credit will be offered to you on you training inscription fees (A value of 250$!) . Your flight time of the day will be immediately registered and will count toward your training time log. Duration: approximately 120 minutes including a 60 minutes flight. 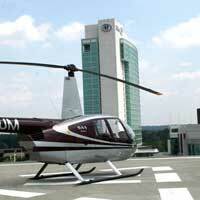 Additional flight time of 15 minutes for St-Hubert helicopter packages on the R22 (helicopter for one passenger). Important: this package cannot be bought alone and must be purchased with another package. 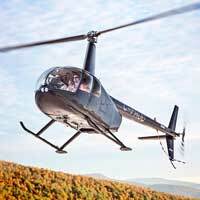 Additional flight time of 15 minutes for St-Hubert helicopter packages on the R44 (helicopter for up to 3 persons). Helicopter - Montreal City tour - 3 pers. Masc. Departure from Mascouche close to Montréal. 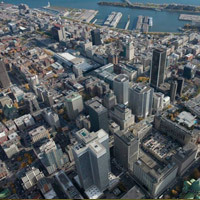 Discover Montreal from the air in an helicopter. The scenic tour will bring you over the principal attractions of Montréal: the beautiful Olympic Stadium, the St-Joseph Oratory, the Mount-Royal, the downtown area with the famous Place Ville-Marie tower, the Old Montreal, the Old Port, the Champlain, Victoria and Jacques Cartier bridges, St-Helen Island with its fort, Notre-Dame Island with the Montreal Casino and the Gilles Villeneuve Grand Prix race track. Get back to your departure point following the majestic St-Lawrence River with the Boucherville Islands. The package is good for 1,2 or 3 persons aboard. The maximum combined weight of all 3 passengers is 600 pounds. A flight of approximately thirty minutes. A fantastic experience. This package cannot be bought alone and can only be purchased an an addon to an helicopter package in Ottawa. Take control of the helicopter in the pilot seat !!! Total duration: approximately 1 hour, including a 30 minutes flight. Maximum weight for participant: 195 lbs (89 kg). First learn how to control the helicopter on the ground than take-off in the pilot seat with an instructor by your side. Once in flight the instructor will let you take the controls so you can fully taste the magic of flying. An unforgettable gift. Pre-flight briefing with your personal pilot/instructor on the functioning of a helicopter, general principals to keep in mind and the flight itinerary. Issuance of the flight certificate. 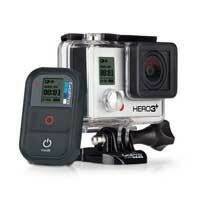 Photos or a video of your flight experience are available at additional cost. A guided VIP tour of the hangar and maintenance centre **. Free access for one person to the Discovery Hub and access to the flight simulator ($) **. ** These activities are offered when available. A 40$ credit for your next purchase with Recreational Flight. Duration of helicopter tour: 30 minutes. 48 hours cancellation. No refund for cancellation less than 48 hours before the flight. Total duration: approximately 90 minutes including a 60 minutes flight. 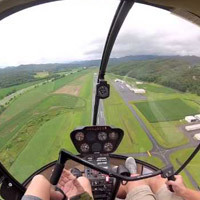 Take control in the pilot seat of a R44 !!! 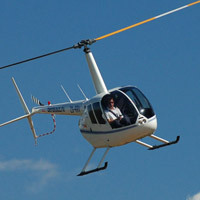 First learn how to control the helicopter on the ground than take-off in the pilot seat with an instructor by your side. Once in flight the instructor will let you take the controls so you can fully taste the magic of flying. A pilot hat is included as well as a 10$ credit on you next purchase on Recreational Flight E-Store. An unforgetable gift. Maximum weight of 250 lbs. Helicopter - Ride - St-Hubert - 30 min. - 3 pers. Take-off from St-Hubert for a panoramic flight of Montreal or the region. Location: St-Hubert airport south of Montreal. Total duration: approximatly 30 minutes. Package good for up to 3 persons. Each person must be under 250 lbs. Maximum combined weight of 625 lbs. A 10$ credit on you next purchase on Recreational Flight E-Store is included. Total duration: approximatly 1.5 hour, including a 60 minutes flight. First learn how to control the helicopter on the ground than take-off in the pilot seat with an instructor by your side. Once in flight the instructor will let you take the controls so you can fully taste the magic of flying. A pilot hat and a flight certificate are included as well as a 20$ credit on you next purchase on Recreational Flight E-Store. An unforgetable gift. Flights available from Monday to Saturday. Maximum weight of 220 lbs. Helicopter Ride - Lachute - 20 min - 1 to 3 pers. Helicopter Ride - Lachute - 20 min - 4 to 6 pers. This package good for up to 6 persons (The price shown is for the entire group). Maximum total combined weight of the passengers of 1200 pounds. The Flight on a Bell 206 Helicopter. Helicopter Ride - Lachute - 30 min - 1 to 3 pers. Helicopter Ride - Lachute - 30 min - 4 to 6 pers. Helicopter Ride - Lachute - 40 min - 1 to 3 pers. Take-off from Lachute Airport for a panoramic flight of the Ottawa River and the Chateau Montebello or the Laurentians region. Helicopter Ride - Lachute - 40 min - 4 to 6 pers. Helicopter Ride - Lachute - 50 min - 1 to 3 pers. Helicopter Ride - Lachute - 50 min - 4 to 6 pers. Helicopter Ride - Lachute - 60 min - 4 to 6 pers. Helicopter Ride - Mascouche - 30 min - 3 pers. 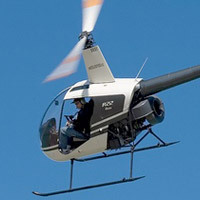 Fly with a Robinson R44 for an initiation flight. A fantastic gift. Maximum weight for the 3 passengers 600 lbs. Helicopter Ride - Mascouche - 60 min - 3 pers. A fantastic gift. Maximum weight of 600 lbs. Helicopter Ride - Mascouche - 20 min - 1 pers. Fly with a Robinson R22 for an initiation flight. Helicopter Ride - Mascouche - 30 min - 1 pers. Helicopter Ride - Mascouche - 60 min - 1 pers. Flight available on week days only. Helicopter Ride - St-hubert - 20 min - 3 pers. Take-off from St-Hubert for a panoramic flight of the region. Total duration: approximatly 20 minutes. This package good for up to 3 persons. Maximum total combined weight of 625 lbs. Helicopter Ride - St-Hubert - 60 min - 3 pers. Each person must be under 250 lbs. Maximum weight of 625 lbs. The price is for 6 persons. Important: The total weight of passengers may not exceed 1150 pounds. Valid locations: Montreal area: Quebec city. Important: The total weight of passengers may not exceed * pounds. Fly tandem on a trike ultralight aircraft with an instructor during 20 minutes, very close to Quebec City. The aircraft take-off from a runway on the ground. An unforgetable experience. Maximum weight of 300 lbs. Fly tandem on a trike ultralight aircraft with an instructor during 40 minutes, very close to Quebec City. The aircraft take-off from a runway on the ground. An unforgetable experience. Maximum weight of 300 lbs. Fly tandem on a trike ultralight aircraft with an instructor during 60 minutes, very close to Quebec City. The aircraft take-off from a runway on the ground. An unforgetable experience. Maximum weight of 300 lbs. Fly tandem on a trike ultralight aircraft with an instructor. The aircraft take-off from a runway on the ground. The package also includes a professional digital photography of you in-flight. An unforgetable experience.